I like washing dishes. For some reason, I enjoy it. I like getting the plates and pots and pans and utensils all squeaky clean. I like the smell of the dishwashing liquid. So there I was again, my usual spot — the sanctified sink. I like washing dishes not just because I like washing dishes. 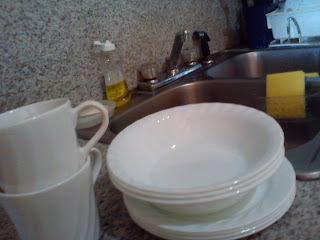 I like washing dishes because I get to ponder or praise or plan or pray or do other things. At times, I find myself worshiping the Lord while rounding up the plates with liquid suds. Sometimes, I ponder about my life while removing the grease off the grill pan. Other times, I pray for others while rinsing the glasses. Or I pray for those who gave us the plates and pots and pans for our wedding. Still other times, I think about projects at work while lining up the dishes on the drainer. I remember one time, while washing the dishes, I was sharing stories with my sister-in-law, Sim. (She and my brother, Dino, came from their couples' Time Out Vacation and they were our houseguests; Dino and Ferdie were out playing badminton at that time.) It just amused me how much we shared about the Lord while I was at the sink! Then there are other times when I find myself singing and/or dancing to cool worship or Christian music while washing dishes. A lot of thanksgiving goes out, too, while I'm busy letting the water run over these tools used for cooking and eating. I tell the Lord I'm grateful for all that's happening in my life...and yes, non-stick pans! 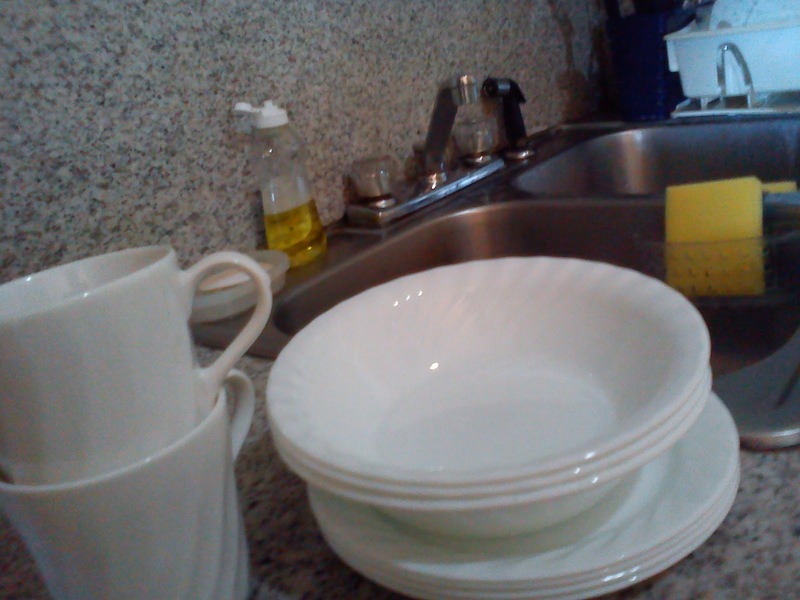 Oh, dishwashing (or should I say, "panwashing") is so easy with these wonderful inventions! Thank You, Lord, for Teflon! It's a different story with the rice cooker pot when the hardened rice stuck to the bottom and sides is as stubborn as a mule. Or the grill pan when bits of burnt meat are stuck in between grooves. During these times, it's rather difficult to worship, as I am very much focused on the task at hand. So I keep at it — several rounds of washing till the pot and pan are free of any food residue. The lesson here? Perseverance. So there you go, the kitchen sink has become a place of God's visitation for me in many ways. That's why I can call it the sanctified sink. Just now I remember [a saint…was it St Teresa of Avila? I could be wrong…] who, while cooking an egg, would levitate in ecstasy because of her love for the Lord. Well, I have never yet levitated in ecstasy while washing dishes. But I can account for the joy I've experienced because of the Lord while doing this mundane task. And now, if you'll excuse me, I'll be preparing in a while...no need for me to wash dishes tonight. Ferdie and I are having [local] steak at [a nearby diner].